ADHD: Who Can Make the Diagnosis? ADHD Coaching: Can It Work for Your Child? Is ADHD Your Child’s Only Problem? Is Your Child Having Social-Adjustment Problems? 2E Kids: What’s the Best School? Does Your Child Have Grit? Is a Small Boarding School Right for Your Child? PCIT: Can It Work for Your Child? Is CBT Right For Your Child? What Is “Prior Written Notice”? What Is An “Appropriate” Education? Extended Time: Useful or Misused? Is This Reading Intervention Right for My Child? Who Should Be On Your Child’s IEP Team? College Bound: SAT or ACT? Is a PG Year Right for Your Child? Are College Consultants Worth It? College: What’s the Right Fit? Can You See Your Child’s Future? Did We Make the Right Decision for Our Son with LD? LD & Asperger’s: Key Differences? Reading Levels: What Do They Tell You? Nothing Helps! What Can I Do? Is it Ok to Postpone a Reevaluation? Are SLD and Dyslexia the Same Diagnosis? ADHD: Is There a Silver Lining? Is it Time For a New School? Does My Child Have APD? ADHD Meds: Risk of Abuse? Is It Time for a Full Workup? For students with LD and ADHD, the Individual Educational Program (IEP) serves as the vehicle to ensure participation in the general education curriculum, a right established by federal law in the IDEA. Following are 6 key provisions of IDEA to keep in mind as you undertake the IEP planning process. The IDEA requires that an IEP contain a statement of measurable annual goals, which includes functional goals, as well as academic goals. The school must provide a description of how it will measure progress toward meeting the annual goals and when it will provide progress reports to parents. The legislation specifies that services be based on peer-reviewed research. Encouraging implementation of time-tested, research-based programs discourages schools from using their own combinations of various programs. Team members are not required to attend meetings if their area of the curriculum or related services is not being modified or discussed. In such a case, both the district and parents must agree that the member’s attendance is not necessary. If a team member’s area is being modified or discussed, that member may be excused if the district and parents consent, and the member submits written input to the team prior to the meeting. Under both circumstances, parental consent or agreement must be in writing. Parents should not feel pressured to consent to a team member’s absence. The purpose of an IEP meeting is to address the whole child. Fruitful discussions require the expertise of all team members. The parents and school may agree not to convene an actual IEP meeting to make changes. 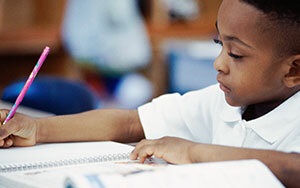 Instead, they may make changes through written documentation that amends the current IEP. In addition, if the parents and school agree, they may use alternative means of meeting, such as video or phone conferences. The IDEA mandates that transition statements, which include courses of study needed to assist the child in reaching measurable post-secondary goals, must be incorporated beginning no later than the first IEP to be in effect when the child is 16 years old. For children transferring between school districts in the same state, within the same academic year, the IDEA requires the new school to provide services consistent with the previous school’s IEP until it adopts the IEP or develops a new one. For children transferring between states, the new school must provide consistent services until it conducts its own evaluation, if necessary, and develops a new IEP. The new school must take reasonable steps to obtain and transfer a child’s records promptly; the old school must take reasonable steps to respond promptly. The child’s present level of academic achievement and functional performance, including how his disability affects his involvement and progress in the general education curriculum. Measurable annual goals, including academic and functional goals designed to meet the needs resulting from his disability. A statement of special education, related services and supplementary aids and services, based on peer-reviewed research. The program modifications and accommodations to be provided. What Is Prior Written Notice? ©Smart Kids with Learning Disabilities®, Inc., Westport, Connecticut, USA. All rights reserved. Smart Kids with Learning Disabilities® is a registered trademark of Smart Kids with Learning Disabilities, Inc. SmartKidswithLD.org is the website of Smart Kids with Learning Disabilities, Inc., a non-profit organization dedicated to providing support to parents of children with learning disabilities and/or attention deficit disorders. The content of this website is for informational use only. It should not be considered as medical, legal, technical or therapeutic advice, and is not intended to substitute for informed professional diagnosis, advice or therapy. Created by ATG Communications and Visual Natives. Maintained by Red Earth Design. Designed by Ann Pawlick.